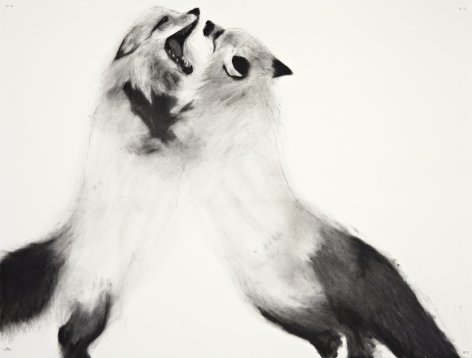 SONDRA MESZAROS creates large-scale charcoal drawings on vellum that explore mythology, natural history, and personal narratives, using animals as surrogates. In renderings of swans, birds, wolves, and deer, figuration verges on abstraction, conjuring a sense of mystery around the creatures. Her work relates to her childhood in rural Ontario where animals were central to her life, leading to a lifelong fascination with the stories and myths surrounding them. 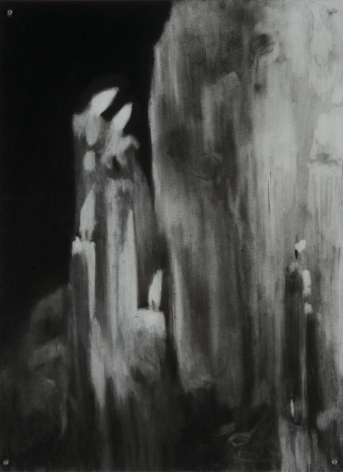 Remembering the experience of hunting with her family, Meszaros develops a parallel between the power of drawing and hunting: “I explore both the obsession of the hunter and the vulnerability of the deer." Meszaros graduated with honors from the Ontario College of Art and Design and received her MFA from the University of Windsor. Her work has been placed in many international private collections and has received several prestigious awards. She currently teaches within the drawing department of the Alberta College of Art and Design. Text by The Art Genome Project, Artsy.